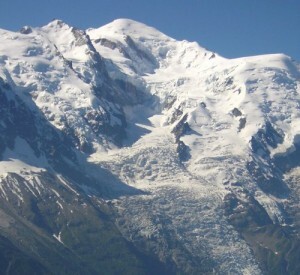 Mont Blanc, highest peak of Europe, is without a doubt the most popular mountain in the world. Under-estimated by many, its ascent is a relatively simple snow route at the high altitude which requires a solid physical condition necessary for the 10/12 hours of effort at high altitude. In order to increase your chances of success, I recommend highly my Mont Blanc six days course. During the Mont Blanc course, the last 3 days are for the attempt of Mont Blanc permitting the ascent in 3 almost equal days with a higher average ratio if success. In case of unstable weather there is also one more chance to succeded. 1st day: les Houches and the Nid d'Aigle (2372 m) ascent to the Gouter hut (3819 m - 4/6h). In order to increase your chances of success, my 6 days courses are conceived to optimise your chances of succes : 3 days of préparation (ice and snow school and an ascent at altitude for the acclimatization) and 3 days for the ascent (normal way or traverse). Dates: Each week from beginning of june until the end of september. If you have your own equipment the cost of the non included fees is minimum 360 euros. If we are realistic it's always at least 400 euros except if you will live like a monk during the week. If you are 2 personns you must envisage a budget of 1500 euros for the course. -The cost of food, drink and transport of the guide are at the charge of the clients, but it's included in the previous estimation of the additional fees. -Don't forget the cost of the rental of your technical equipment. -Book as soon as possible because of the difficulty of the booking of the hutte. (Even if there are some mountaineering organizers telling that they can have easily last minute booking: they lie to you and you could be seriously disappointed). Because of the recent changement of the glaciers on the Cosmiques Route, the risk of ice falls is becoming more important on the traverse of the 3 Monts Blancs, we recommand the Gouter Route. In the morning, on the Mer de Glace, the guide will teach the French technique of moving on ice, front pointing and down climbing. The afternoon, ice climbing and the guide fix ropes on a steeper wall. You will climb more difficult ice pitches. 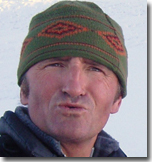 The guide will also show to you the basics of crevasse rescue, placement of ice screws and of anchor systems. Descent at the end of the afternoon by the mountain railway to Chamonix. A climb at altitude with a night in a hut to develop your technique and fitness. The choice of routes is depending on your technical level, the mountain conditions, weather and safety. Aiguille du Tour (3500m) or mountaineering around Aiguille du Midi (3842m) are 2 good options. The goal is to increase your acclimatisation as much as possible, as well as your technical level. The walk up to the Cosmiques, from the top station of Aiguille du Midi cable car, is just 100m high from the col, the hutte approach is very short and easy in that case (but there is a quite important risk of objective dangers on the Cosmiques route to Mont Blanc because of the ice falls). For the Gouter route, we start at 7.00 in the morning, we take the cable car from les Houches, then the tramway of Mont Blanc up to 2300 meters (nid d'Aigle, Eagle nest), the ascent to the hut takes about five hours and involves an easy rock climbing part. In the evening, the guides will help you to prepair your equipment for a quick departure the next day. If you are ascending via the Gouter route you will return to the hut the following day and you can leave any excess weight in the hut. If the ice falls on Cosmiques route are in good conditions, we ascend sometimes via the Traverse or 'Royal Route' the summit. If we opt for the Cosmiques Route, wake up 1am (01.00 hours) for breakfast. You must respect a minimum timing 2 hours forTacul, 4 hours for col de la brenva, 7 hours maximum on Mont Blanc for the safety and for keeping good snow and safe mountain conditions. The climb is generally 6-7 hours long and the route is more demanding, exposed and technical. We descend generally on the gouter ridge. From the Gouter Hut, the ascent usually takes about four hours. For the first few hours you will ascend by night. We reach the top for the sunrise (usually about 7:00). All around us, the greatest peaks of the Alps, such as the Matterhorn, the Gran Paradiso and Monte Rosa. we will descent without waisting time for loosing altitude the snow ridge towards the hutte. When we go back to the Gouter hutte, we rest a bit, rehydrate and eat some lunch before going on. After a night in the Gouter Hutte or in the Tête Rousse Hutte, we continue the descent to the Eagle Nest top station of the "Tramway Mont Blanc", we take the train and then catch the cable car to Les Houches and Chamonix. If the conditions are not good the day 2, attempt day 3 on Mont Blanc and descent to Chamonix: a very long day.